When well-developed setups lead to brilliantly executed gags, throw in some adorable house pets and endearing street animals and you get Universal Pictures and Illumination Entertainment’s answer to what toys do when the owners aren’t around, The Secret Life of Pets. More precisely, this movie could be described as Toy Story meets Oliver and Company meets Homeward Bound. 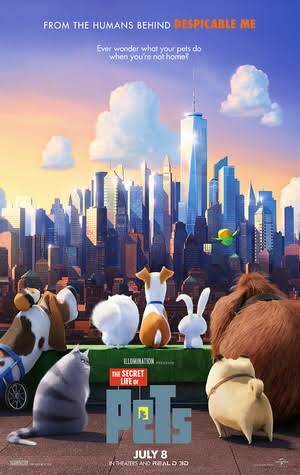 Backed by an exquisitely talented cast of voice actors and excellent writing, The Secret Life of Pets could be what ushers Illumination Entertainment (an NBCU company) into the ring with Disney-Pixar. Prior to this movie, Illumination/Universal certainly created some fantastic animated films including The Lorax, Despicable Me, and others; but this film is the first to really be on par with the Disney-Pixar quality that many of us have come to love and expect. Fast-paced and comedically timed very well, this movie is sure to entertain and warm the hearts of anyone who sits down to watch it. Is it quite as endearing as Toy Story? Not exactly; but it is very close and serves as evidence that we should come to expect this quality and higher of animation from Universal/Illumination. Although the movie is marketed to kids and teenagers, there is certainly enough comedic subtext, easter eggs, and nods to films that adults will greatly appreciate as well. One of my personal favorites is in the Millions short film before the feature. One of the minions is wearing a hat that states “let it grow” while he’s cutting the grass. When Max (Louis C.K. ), a spoiled terrier living in a New York City apartment building with a beautiful view meets his new roommate, his perfect world is rocked. New roommate Duke (Eric Stonestreet), a giant rambunctious dog, mixes as well with Max as oil does with water. They are complete opposites in nearly every way. Max soon gets the idea to set Duke up for failure by sabotaging the house. Unfortunately that idea backfires and just serves to stoke the fire of animosity. After a prank in the park takes a turn for the worst, both Max and Duke are lost in the seedy underbelly of New York City. One step forward and two steps back is exactly the pace of the journey home for both canines. Following a run-in with a street gang led by the ferocious but cute bunny Snowball (Kevin Hart), Max and Duke find themselves in Brooklyn after escaping the hoard of animals bent on their destruction. Along the journey home, Max and Duke are forced to work together and support one another in order to have any hope of returning to their comfy apartment. The Secret Life of Pets‘ success is in-part due to the successful setup and payoff of gags. This can be a dangerous platform on which to build an animated comedy because there is a high risk of the narrative primarily resting upon the gags instead of the gags enhancing the diegesis. Fortunately for audiences, this film successfully pairs a well-developed and paced narrative that will keep your attention and deliver laughs for the entire runtime. Sometimes comedies, whether animated or live action, can spend too much time in the development of gags rather than on the visual storytelling. For instance, some movies write the gags first and then try to integrate a story that attempts to tie all of them together. What I appreciate about The Secret Life of Pets is the strong story inclusive of sight gags and double entendre humor to satisfy a diverse audience from different backgrounds and ages. In addition to the writing, the vocal talents are also instrumental in the success of this animated feature. Leading the “pack” are of course comedians Louis C.K. and Kevin Hart, but the entire cast is perfectly pairs with his or her animated persona. For the cat lovers out there (and yes, I am one of them), there are deftly come good comedic jabs at dogs. But the dogs also get in some good ones on the cats. Haha. The setting of the movie is New York City, or an idealistic surreal New York City slightly augmented to fit the pacing, genre, and feeling of the film. I’d like to know what job Katie has to be able to live by herself in an apartment with such a beautiful view. But I suppose it’s just as well that we don’t since the focus is on the dogs. On the view from the apartment, though. Much like the view from Frasier’s upscale urban trend-setting apartment in Seattle faced a view of the Seattle skyline that doesn’t actually exist, unless you are looking at downtown from the surrounding mountains and hills, I am not entirely sure the view from Katie’s Manhattan apartment exists either. The view of the city seen from Frasier’s apartment was selected in order for the Space Needle to have a prominent placement in the skyline. In the same vein, I believe that the unrealistic view from Katie’s apartment was selected in order for the Freedom Tower to have a strong presence. I know, I am analyzing an element that doesn’t really have an affect upon the film; but since the film is actually very well done, I thought it would be fun to look at the setting of the movie. Although I can almost guarantee you that his film won’t see an Oscar nom in the animated feature category, much less a win, since the Academy believes that only Pixar can create Oscar-worthy animated films, I find The Secret Life of Pets to be a fantastic animated feature filled with action, adventure, comedy, and some touching moments as well. All around, it is enjoyable for the whole family and will cause many owners to wonder what their pet does while he or she is away at work. One of my favorite parts of the movie is the musical sequence at the sausage factory. So much symbolism to discuss. Haha. So, yes. This movie even includes a musical number worthy of–I am sure–many memes to come over the next few months. It’s no “Up” or “How to Train Your Dragon,” but you’ll definitely be entertained with the plot, writing, and characters.